Mother-in-low and sister-in -low have allegedly killed a mother named Ratna (22) before her only two years child at Gafargaon under Mymensing on Sunday evening. It is learnt that after killing, the body was kept hanging at the balcony of homestead and mother-in-low and sister-in-law fled away from their home. This incident happened at Pachaher village of Tangabo Union under Pagla Thana in Gafargaon Upazila. Sources said, Rafiqul Islam , son of Abdur Rahim of Pachaher village married Ratna, daughter of Abdur Razzak man of Moyra village four years ago. After marriage mother-in-low Kulsum and sister -in-low Khadiza tortured Ratna physically and mentally. This couple has a two years son named Ridon. Rafiqul husband of Ratna is in service in Dhaka.With family feud after Magrib Azan mother-in-low and sister-in-low saffocted and killed Ratna on Sunday. MURADNAGAR (Cumilla): Locals at Chhaliyakandi Bazar in Muradnagar Upazila formed a human chain on Friday protesting killing of housewife Brishti Saha by husband recently. 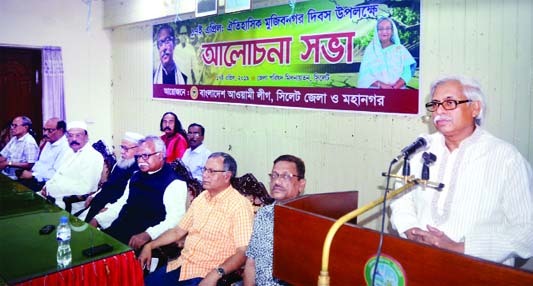 RANGPUR: Enamul Habib, DC, Rangpur addressing a discussion meeting as Chief Guest to celebrate the Hahnemann Day and Homeopathic Day marking the 264th birth anniversary of Dr Hahnemann on Thursday. 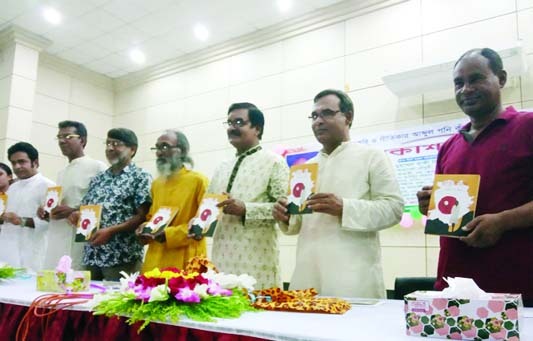 MELANDAH (Jamalpur): The cover unveiling ceremony of the book 'Matrikanan' by poet and singer Abdul Goni Kur was held at Mirza Azam Auditorium recently. DAMUDYA (Shariatpur): Damudya Upazila Health Complex arranged a discussion meeting on the occasion of the concluding programme of the National Health Service Day yesterday. JOYPURHAT: Students of Hinda High School in Khetlal Upazila boycotting classes protesting several irregularities of the school on Thursday.